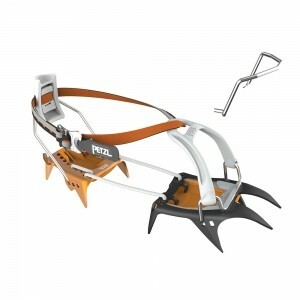 I bought these crampons last november and used them throughout the winter months. My first crampons were a set of Grivel crampons but my Aku boots were not rigid enough and the grivel crampons kept coming off. Have to say it was not the fault of the crampons just the wrong boots. Boots are B1. So I didn't want to replace my boots and found these hybrid crampons instead. Firstly they came with a bag the grivel crampons didn't. They packed down very well when worn my feet felt very stable and the crampons felt very secure because the strap is long enough to tuck under and across and secured in place. The toe and heel section is conected by rope (CORD-TEC flexible linking system) instead of a metail connector. this allows the crampons to be folded down tightly and it allows the crampons to be fitted to boots like mine with a little flex securely with no chance of them coming off. The crampons felt a lot lighter than the other crampons I had owned. Wieght is 540g for the pair.